Co. Meacham, who succeeded in obtaining 1000 bushels of carrots per acre, for several years, estimates the expense per acre at $35. 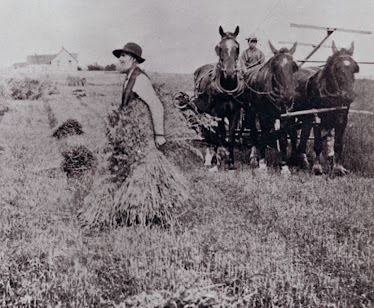 This culture adapts the land admirably for wheat or barley. As a food, the carrot is extensively used in England, and to some extent in our eastern and northern States, as horse fodder, and is well adapted to oxen and hogs, &c. The carrots should be boiled or steamed, or, if given raw, sliced with a vegetable cutter. According to Antoine’s tables, 276lb equal 100lb of hay; they make twice as good fodder as turnips and nearly equal to potatoes. Carrots and hay are a good fodder for horses, or, when given alone, about fifty pounds prepared will be necessary daily. They are very fattening. Years ago, my mother bought a juicer and made carrot juice. She tried to get me to drink it but I wouldn't even give it a try. I couldn't bear the thought of drinking carrots. My wife had no objections to the idea. She drank a glass of the liquified roots, and pronounced it very good. I wasn't persuaded. But then, after months of hearing how good carrot juice was, and after being nagged by my wife to at least try it, I gave in. Wow, was I surprised. That carrot juice was so good that I decided we needed to get ourselves a juicer, and I needed to grow more carrots! On another subject, I'm sure you have heard of the listeria-from-melons outbreak that is currently in the news. 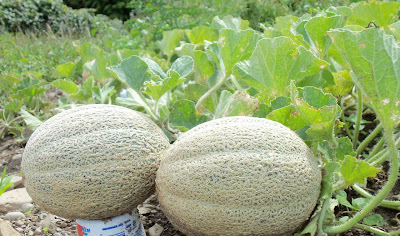 People are eating melons (normally a downright healthful food), contracting listeria, and dying. This sort of thing doesn't surprise us anymore—Industrial Nation food has a long track record of contamination and manslaughter. On the other hand, how many people have you known to get sick and die from homegrown food? Do we Americans have a right to freely purchase and consume food produced by our neighbors, or even ourselves? As unbelievable as it sounds, some "authorities" in government don't think so. That said, I encourage you to read No Right to Produce or Eat Food by Walter Jeffries. No matter what breed you have, something is necessary to reach the highest success in raising good milkers. It’s a great thing, to be sure, to have good blood, whether it be Ayrshire, Jersey, or Short-horn grades, but apart from this important advantage, the course of treatment in raising a milker is somewhat different from that in raising a beef animal, or animal for labor. The calf should be well fed and petted while young. Well fed, to induce a rapid growth, so as to enable the heifer to come in early; petted, to make her gentle and fond of the presence of her keepers. Fondling helps to create a quiet disposition, so important in the dairy cow, and this education must begin when young. 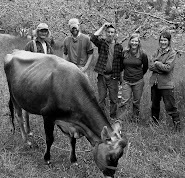 For a milker, we would have the heifer come in at two years old, and if she has been well kept, so as to have attained a good size, she is then old enough to become a cow. She will give more milk for coming in early. It forms the habit of giving milk, and habit, you know is sort of a second nature. An older bull is better. We use too many young bulls. A three or four year old is far better as a stock-getter than a yearling, and many prefer a five or six year old to any other. After the heifer has come in, let her feed be regular. Clover is preferred to all others for the stall feed. A little oatmeal induces a large flow. Indian meal is rather fattening. 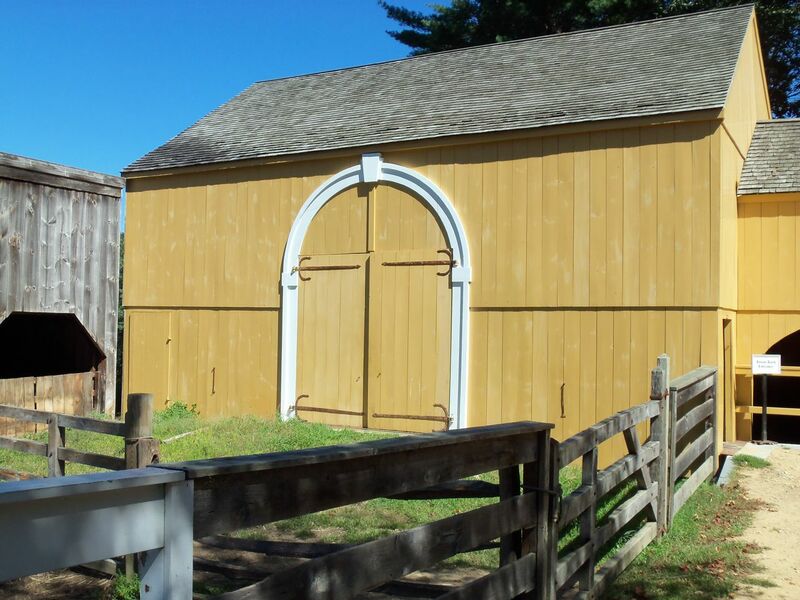 In bad weather, give her a clean, airy stall. 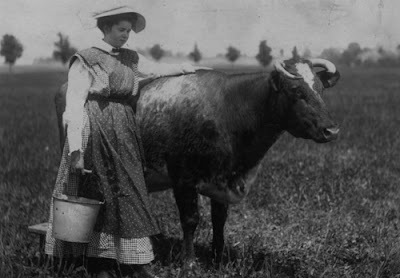 Up through the middle of the 19th century, dairying on New England farms was women’s work. Boys might help with the milking, but farm girls learned the “art and mystery” of butter and cheese-making from their mothers. The dairy was a crucial part of every farm’s economy, and it became ever more important as New Englanders gave up growing grain to concentrate on butter and cheese. 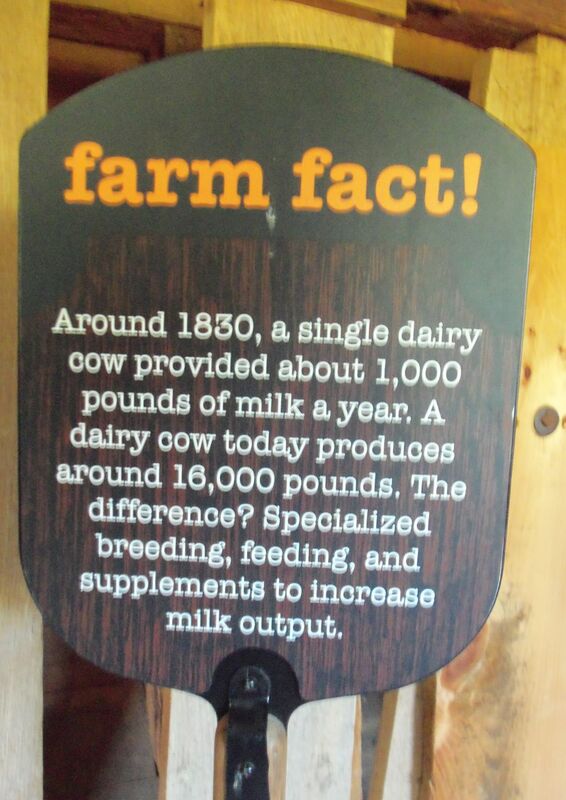 On the majority of farms, the dairy produced most of the surplus that could be traded for goods or turned into cash. Salem Towne Jr., whose house is just next door, was a farmer and businessman who frequently traveled. 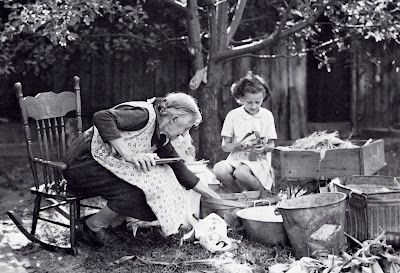 He wrote his wife Sally letters with instructions about the farm’s workers, field crops, and livestock—but he never mentioned the dairy, which was busy producing butter and cheese. That was Sally’s domain, and he left its management to her. This milking stool was in the Salem Towne barn at Sturbridge Village. The seat is a section of tree (the bark-side bottom is rounded), as are the handle and legs. 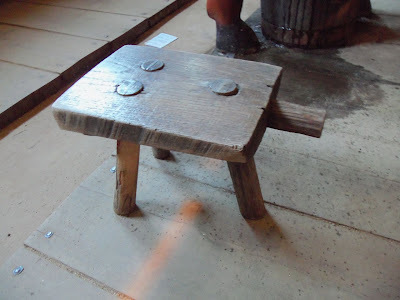 A stool like this would be a great little woodworking project. I'm inspired. 1. To sew and knit. 2. To mend clothes neatly. 4. To dress her own hair. 5. To wash dishes and sweep carpets. 7. To make good breads, and perform all plain cooking. 8. To keep her room, closets, and drawers, neatly in order. 9. To work a sewing machine. 10. To make good butter and good cheese. 12. To keep accounts, and calculate interest. 13. To write, fold, and superscribe letters properly. 14. To nurse the sick efficiently, and not faint at the sight of a drop of blood. 15. To be ready to render efficient aid and comfort to those in trouble, in an unostentatious way. 16. To receive and entertain visitors when her mother is sick or absent. A young lady who can do all those things well, and who is always ready to render aid to the afflicted, and to mitigate the perplexities of those about her, will bring more comfort to others and happiness to herself, and be more esteemed, than if she only knew how to dance, simper, sing, and play the piano. 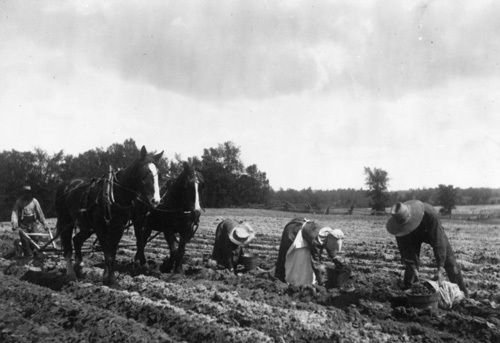 In the Agrarian Nation entire fields were cultivated by hand, as shown in this picture. The man is hoeing mangle beets, of which mangolds are a type. 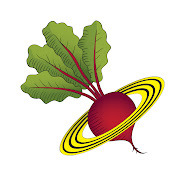 These were primarily fodder beets and we have discussed them here before (see this link). I’ll bet you have no idea what “singling mangolds" means. Well, today you’re going to learn what it means and how it's done, and you’re also going to read a very fine essay by the English author, John Stewart Collis. 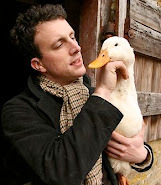 This essay comes from his book, The Worm Forgives The Plough (click HERE for more information about the book and Collis). The period between haymaking and harvest is rather an uncomfortable one. We are between two worlds, as it were, one dead, the other as yet powerless to be born. Slack off then? Pause in well-doing? Far from it. Now is the time to get down to the remainder of the hoeing before it is too late. There was certainly still plenty to be done here on fields of kale, swedes, and mangolds. In fact it was only now that we began to single the mangolds. The shoots, sown by drill, come up close together in long lines. They cannot be left like that but must be given room to expand—that is they must be singled. About a foot must be left between each shoot. Thus while hoeing weeds away you also hoe out a vast number of plants—a wholesale destruction which gives one an uneasy feeling, for what good can come of these miserable little shoots you have left at such a great distance from each other? Frequently the shoots grow in pairs, and as it is impossible to use the hoe for separation it is necessary to stoop right down and separate them with your fingers. Thus singling is hoeing multiplied. I have not written enthusiastically about hoeing, though at times I have enjoyed it. I cannot remember any time having enjoyed singling mangolds, and as I frequently had to do many hours of this alone, I again began to feel time drag. While performing jobs of this sort I have come closer to understanding the history of mankind. How easy it is, I said to myself one day, how easy while singling mangolds to understand the rise and fall of civilizations! How did it start? Who conceived the town, the city, the metropolis? Into whose mind first sprang the idea of the machine? Who first framed the fabric, turned the wheel of civilization? The countryman, of course. 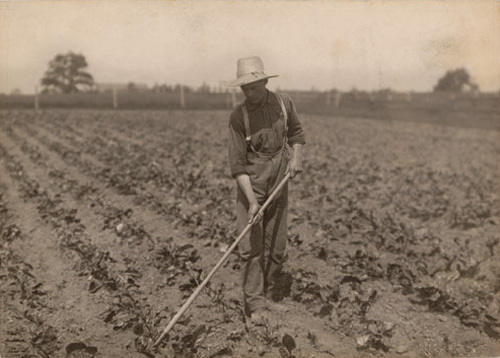 He stood on the field, spade in hand, trying to till the soil. A hard job with only that implement. So he invented a horse-movable spade—the plough. He stood amongst the ripened corn with a sickle. He could improve on that, so he made the scythe; and he went on improving all his devices in his conquest of nature—he was the first mechanic. 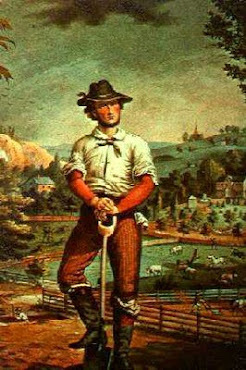 And as he toiled in the fields, often covered with mud, or wet, or freezing cold, or his back splitting as he stooped over the mangolds, he began to think how wonderful it would be to get away from this struggle, to escape altogether from Nature. So he devised something more than a village, he built a large number of houses with intervening paths—a town. He went further—he conceived the idea of the Great City. How marvelous it would be, he thought, to make a place so vast in extent that you could not even see the soil, to make the paths therein so smooth and clean that you would not get a speck of dirt on clothes or boots, to see delicate women walking along who did not know the difference between a bangle and a mangold, to have lights turned on by a switch and hot water by a tap, to have shops making a blaze of light in the darkness, to enter glorious buildings in which you would find entertainment and instruction, and great churches like jewels so that the eyes of those who gazed on them grew dim. Gradually the edifice of civilization was set up—in the image of the countryman’s desire as he stood on the desolate field. But as the years passed and generation succeeded generation the townsman began to forget that he had come from the country, and the countryman that he had made the town. And because the people in the towns were more comfortable and better looking and with wider interests than those in the country, they began to feel more important and to despise the very people upon whom they relied for three meals every day. And because they felt important and began to look it, the countrymen themselves were impressed and thought them wonderful. As the process went on it was the man in the street, the man in the city, the citizen, who came to be regarded as the only person who counted, while queer derogatory names were found for the men in the fields. The citizens multiplied immensely, became far more powerful than the peasants, and decreed that town wages should be much higher than country wages. Seeing how matters stood, many agriculturists cried, ‘Away from the land!’ shook the mud off their boots, and joined the citizens. But as time went on a strange unease began to afflict the people in the towns. As they walked through the everlasting streets they began to pine for the open fields, for the blessed sun, for the realities and simple joys they had left behind. They began to declare that civilization was rotten at the core and perished at the roots, and that nothing could save it except a great Unindustrial Revolution. Not only citizens, but ‘City Men’ began to say in their cups that their work was a farce and that they would rather ‘keep a pig’. Intellectualists insisted that they were ‘really peasants at heart’. A cry of ‘Back to the Land’ went up, not from those on the land but from those in the towns. Thus my meditation as I stooped over the mangolds. The same conception had occurred to me forcibly earlier in the year when one evening I suddenly felt a great desire to visit a town and dine in an expensive hotel. Changing my clothes suitably I went in. I found a very nice hotel. So great is the difference between the agricultural world and the world outside—a strange, dream-like, picnic of a world it looks from the field—that I blinkingly looked round at the lounge as if seeing such a place for the first time. The good lighting, the polished floor, the groups of clean and well-dressed amiable-looking people held my attention. It was now time for dinner and I entered the dining-room and sat down. I was greatly taken with the spotless table-cloth, the seven pieces of cutlery (I counted them), the vase with the roses in it, the perfect floor, the paneled walls, the electric candlesticks. The other tables were occupied by miscellaneous people, all looking well set up, pleased, and expectant. Waiters began to come round, dressed in white jackets and black trousers. Four courses were brought to me with great expedition. I examined each plate in turn—very nice, one with a picture of watercress on it. I looked round at the smiling faces of the people, all wearing expressions not seen outside; and at a waiter bending over a group with the deeply knowing and confidential smile of a man who can produce wine. I looked at the foods that were brought to me—some meat, peas, greens, and potatoes. Doubtless they came from the land, but it hardly occurred to me to make the connection, certainly no one else in the room did so; the food simply came—no, not even from the kitchen—from behind the screen from which the waiters, like magicians, emerged again and again. For this, I saw, was a dream place, not subject to reality. If a ploughman, I reflected, were to come into this room suddenly, as such, he would be thrown out, or ‘asked to leave’. And that would be right. I would be the first to cast the first stone at him. It would be an unforgivable intrusion. For he would have broken the spell, destroyed the film and the fantasy of the agreed illusion, infringed upon the dream mankind has dreamt on the bitter field—this escape from Nature, this shelter from the storm, this place, this paradise. The whole thing was so fantastic and delightful, and knowing that a bus would soon be due outside, I kept a firm watch on myself (like a man over-drinking) lest I linger for ever here and become lost to the agricultural world. However, I pulled myself together and went out into the pouring darkness and caught the bus and then took my bicycle for a final part of the journey. 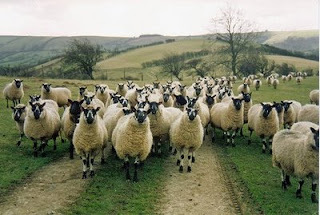 I was soon passing our farmyard, which adjoined the road. There it was—deserted, silent, a pocket of gloom, a nonentity of a place, something to pass by. Was it really possible, I asked myself, that this slushy yard, so humble, so lacking in all the props and appointments of Power, was yet the foundation of society?Yet so it was. Upon this the fabric rested, upon this was erected all that glittered and all that shone; and I knew that the lighted palace from which I had come where the Figures paced on the polished floor, and the Magicians emerged with food from behind the screens, could not otherwise exist at all. I got off my bicycle and gazed into the farmyard—at the stable door, the pile of manure, the muddy pool, the old binder in the corner, the oil-cans and sacks, the three wagons and the two carts under the shelter. I peered at these things through the dreary dank of the dripping darkness, with some intensity, as if aware that here only, in this place, and in such guise, could I find the roots of grandeur and the keys of life. There is a good deal of excitement at present in regard to the alleged adulteration of butter. 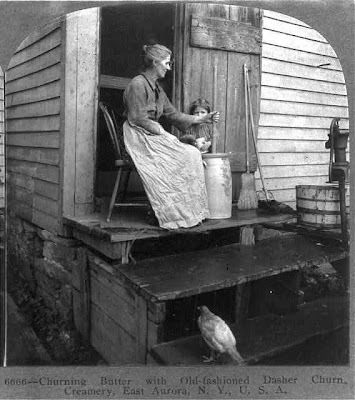 It is said that the adulteration of natural butter by various intermixes of lard oil, tallow oil, and other foreign ingredients, has been practiced to such an extent that in some States the spurious product has found its way into almost every town and city, and is nearly equal in quantity to the entire production of natural butter. It is said also that these fraudulent imitations cannot ordinarily be distinguished from natural butter by the purchaser, and even may baffle the scrutiny of experts. To test the extent of the traffic, thirty samples were purchased at random in the markets of two large cities, all being sold as pure butter. A chemical analysis showed that twenty out of the number were oleomargarine, most of them with hardly a trace of pure butter in them. We are inclined to think that the moral sense of the community averages as high now as at any previous time in the world’s history, but the progress of science aids the rascal and the honest man alike. The same advance in chemical knowledge that furnishes us with our beautiful aniline colors, by utilizing an almost worthless product, equally enables the cheat to palm off his oleomargarine as the purest of dairy butter. It is remarkable, really, the myriad ways the industrial providers can morph natural food into something unnatural or—worse yet—a synthesized copy. This fare of the industrial providers is food foolishness. These people, these companies, these forces, exalt their fake products, boldly proclaiming that their creations are better than the unadulterated bounty created and provided by the sovereign God of all creation. What gall! That pretty much sums up my opinion of oleo, which America now consumes bazillions of tons of every year—but you won't find it in my house. 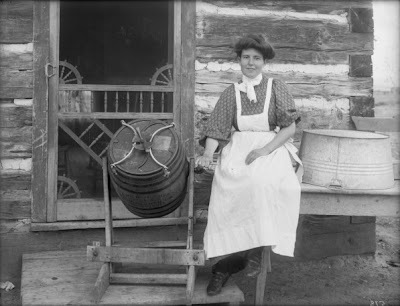 Most farm wives in the late 1800s and early 1900s churned butter and sold it to the the local grocer. 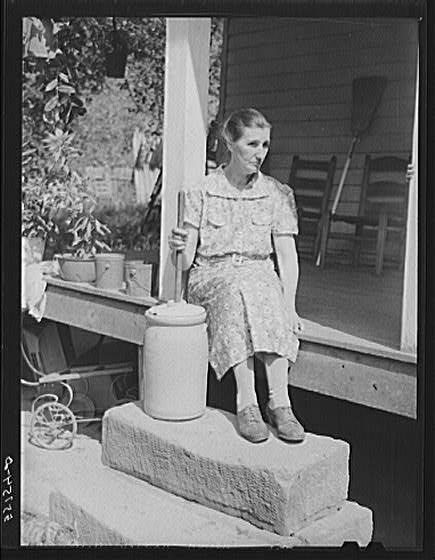 My great, great grandmother Josephine Jordan, up in northern Maine did this. She also sold eggs to the grocer. It was a steady source of income. This simple farm wife from the past, churning butter on the stoop of her home, and probably selling it to the local grocer, would be considered a criminal if she did that sort of thing these days.